Last week, the US Fish and Wildlife Service allowed elephant trophies from Zimbabwe and Zambia to be imported to the US, lifting a previous ban under former President Barack Obama. Last Tuesday, the US Fish and Wildlife Service lifted a ban on importing elephant trophies from Zimbabwe imposed under President Barack Obama in 2014. At a meeting of government officials and professional hunting associations in Tanzania, the US federal agency announced that elephants that were legally hunted in Zimbabwe and Zambia between January 21, 2016, and December 31, 2018, could now be imported into the United States. The agency later issued a notice saying it had “made a finding” that the hunting of trophy African elephants in Zimbabwe during this period “will enhance the survival” of the threatened animals. The notice does not mention Zambia. On Friday, however, US President Donald Trump tweeted that he was putting the big game trophy decision on hold until he had reviewed all “conservation facts”. He also said that his decision on the trophy imports will be announced next week. Interior Secretary Ryan Zinke tweeted a statement, saying “President Trump and I have talked and both believe that conservation and healthy herds are critical. The USFWS justified lifting the 2014 ban by arguing that well-managed trophy hunting can benefit conservation “by generating funds to be used for protecting wildlife habitat, monitoring populations, wildlife management programs and law enforcement efforts”. The agency also argues that trophy hunting fees provide an incentive for the local communities to protect wildlife. In its report, the USFWS said that the Service had sent a letter to Zimbabwe on April 4, 2014, requesting information on elephant population in the country and how U.S. hunters contributed to the enhancement of the species. But the African Wildlife Foundation said that although ZPWMA has developed a good elephant management plan, the authorities lack the necessary funding to operationalize it. “ZPWMA is terribly under-funded,” AWF said in a statement. Primatologist Jane Goodall added that “very little money [from trophy hunting] is actually used for conservation, and that the safari companies organizing these murders have their own staff, so that typically the local communities receive very little compensation. They lack vehicles, fuel, ammunition, and even rations. While it is true that hunting can provide revenue for conservation, it is false to assume it will come close to meeting the urgent needs of ZPWMA. The move to lift the ban also sparked criticism from some Trump supporters. “I don’t understand how this move by @realDonaldTrump Admin will not INCREASE the gruesome poaching of elephants,” Laura Ingraham, Fox News host tweeted. Ed Royce, a member of the Republican Party and the Chairman of the United States House Committee on Foreign Affairs also criticized the decision, calling it the “wrong move at the wrong time”. Zimbabwe is currently undergoing a political upheaval, with Robert Mugabe, Zimbabwe’s 93-year-old President being sacked from the ruling party last week and the military taking over. 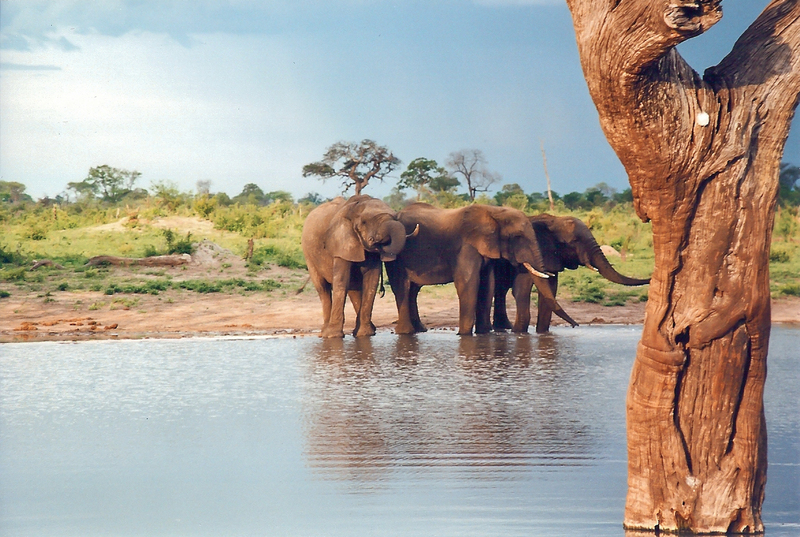 Latest surveys have estimated that Zimbabwe has about 80,000 elephants. While this is a large population relative to other African countries, elephant numbers in Zimbabwe have declined by 11 per cent since 2005, the surveys found. In northwestern Zimbabwe, populations have fallen by 74 per cent. Elephant population in Zambia, estimated to be around 20,000, has also suffered an 11 per cent decline during the past decade. The decline has been especially drastic in some parks like Sioma Ngwezi National Park in southwest Zambia, where poaching has reduced elephant numbers from 1,089 in 2004 to 48 in 2015.